We are a full-service, owner-operated remodeling company dedicated to providing you with an outstanding home remodeling experience. Our goal is to help you create your dream home. We offer a wide range of home remodeling services to help you achieve this goal. Our designer’s valuable insights and suggestions will complement your overall vision. We are available to accompany you to the showrooms where you are able to take advantage of our professional discount. We do entire home renovations including full kitchen & bathroom remodels, flooring & tile installation, in addition to painting services & new replacement window installation. All of these services provide a fresh new feel for your home. We offer full electrical services, bringing your home up to code and installing efficient modern lighting fixtures. Recessed lighting provides a sleek and clean look to any room. Adding and updating a fireplace to your living room, family room or master bedroom creates a warm, inviting space that you will enjoy for years to come. We ensure that your plumbing meets all current industry standards. 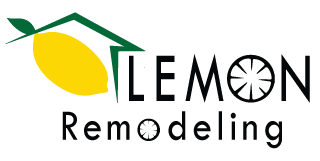 Let Lemon Remodeling help you realize your dream home!